I grew up eating homemade Taffy. My great grandmother Harriet was a pro. She had a amazing way of “testing” the candy to see if it was ready to pull off the heat. She would simply dip and swirl two fingers in that hot, boiling syrup! No Cold Water test or Thermometer needed. If enough of that hot candy stuck to her fingers . . . she knew it was done. Yikes . . . I don’t do it that way! I wanted Soft Salt Water Taffy . . . like the Trolley Square kind of Taffy. Those of you who live near SLC, know what I mean. They have many flavors and colors, but our favorite is the Vanilla Nut & the Chocolate. 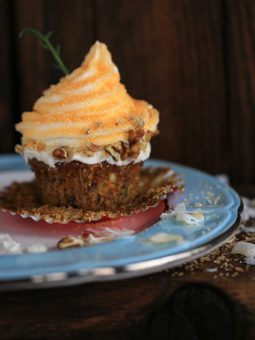 This recipe is pretty darn close! I didn’t rely on my fingers for testing purposes. 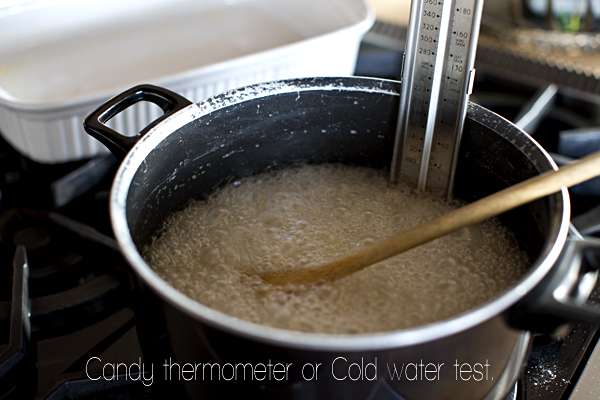 I mostly rely on the “Cold Water Test,” but also stuck my candy thermometer in for good measure. FYI: I pulled my candy off the heat at about 248 degrees. While stirring it, it seemed too thick to cook all the way to 254 degrees. I did a cold water test, and sure enough . . . it rolled into a firm ball and stayed that way. Off! Off now! I do believe that I need a new candy thermometer. 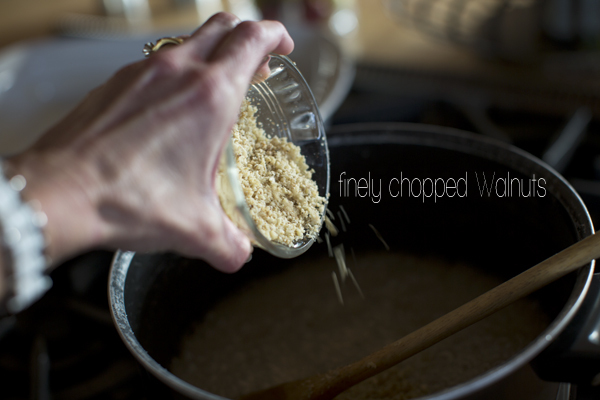 This is optional of course, but I added very finely chopped walnuts and stirred well. 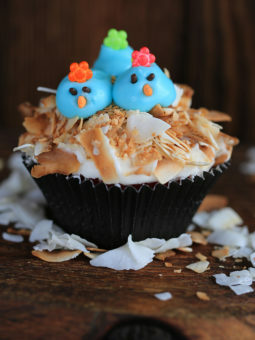 I doubled the recipe below and added about 1/2 cup of fine nuts and 2 teaspoons of good vanilla. 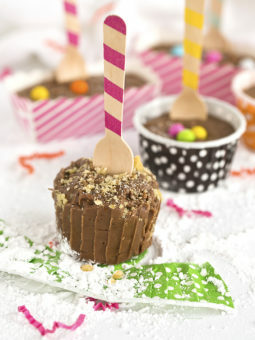 You can add color as well as any oil flavorings you would like. Remember: You can always add more, but you can’t take it away! Pour the hot candy into a dish that has been very generously buttered. Let it cool down until you can hold it comfortably in the palm of your buttered hands. Now is a great time to clean up all the mess you’ve made. If you make a single recipe, you can stretch, pull and re-butter all by yourself. If you double the recipe . . . enlist a less than enthusiastic helper . . . like I did. Oh look how lovely my husband stretches taffy! Have a long piece of wax paper ready and willing to hold all your stretched taffy. Look closely at the long ropes. See how the back rope is tighter & also whiter in color. It has been pulled a bit longer than the front rope & cut pieces. We did this on purpose, to see which we would like better. The next day, both were good . . . but the softer taffy WON. Stretch it until it’s lighter in color, but the longer you stretch the firmer the taffy will be. Cut your Taffy in the length you desire. We did about 1″ to 1 1/4″ pieces. My hubbie was the snipper – and he wasn’t as precise as I had hoped. Laughing . . . I hope he doesn’t read this post! Cut wax paper and get to wrapping . . . it’s the worst part of the job. My helper suddenly disappeared and didn’t come back. Keep your taffy in a zip-loc bag and it will should stay soft & chewy. 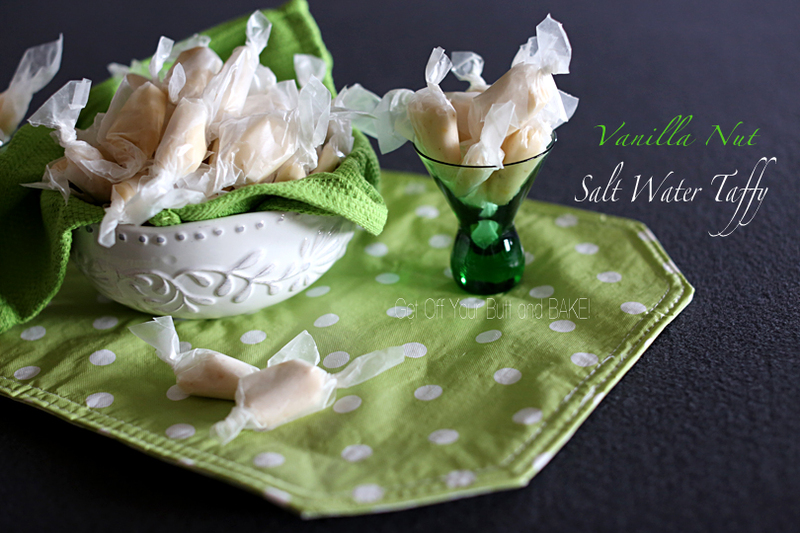 Next time I make this, I’m going to make Chocolate Salt Water Taffy. I’ve watched my Grandma’s do it. They simply melt a couple squares of Unsweetened Baking Chocolate in the hot candy. I hope everyone has a great Memorial Day Weekend. Mix sugar and cornstarch in a saucepan. Stir in corn syrup, butter, water and salt. Cook over a moderate heat until mixture reaches 254 degrees or until a few drops tested in cold water form a ball which holds its shape. Remove from heat, add a few drops of food coloring and flavoring extract, and pour into a buttered platter. Cool until it can be handled comfortably. Butter your hands and pull the taffy until it is light in color and firm enough to hold a shape. Stretch into a roll about 1 inch in diameter and snip off bits with kitchen shears. Wrap each piece in small squares of waxed paper. I seriously still can not believe she would just dip her fingers in the boiling sugar and test it that way. That is crazy to me. I wonder if she had any feeling in them. I laugh about “your little helper” vanishing during the wrapping part of this project. That is just to funny. But, I am glad Dad did a little stretching for you. i LVOE the pictures. They are so adorable. Love the green polka dot. So adorable. They look great! Yes…..possibly our Candy thermometers are a bit different. Pulling it longer, until most of the gloss is gone, will result in taffy that will keep it’s shape a bit better. You can also just cook it a few degrees longer . . . as you thought. I do hope you were able to enjoy the taffy anyway! Once you know that ALL the sugar is dissolved and it is at a full boil you can stop stirring. Don’t scrape the sides of your pan either. It was probably cooked a bit too long. 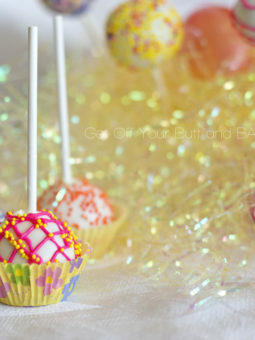 Check your candy thermometer as well. I thought mine was working properly and found out I needed to subtract a couple of degrees while cooking candy. Hopefully you still were able to enjoy it.